“One of Amarnathji’s strongest assets, the one I admired the most, was his tremendous self-confidence. and first of all, we would like to wish him a Very Happy Birthday !! Since the past 10 years, by the grace of God, Salim Khan has been living life on his own terms. A peaceful state that everyone dreams of – enjoying his routine early morning walks, no pressure, no tension, just happy to be surrounded by family and friends. With those calm feelings one morning, while taking a walk along with some friends, Salim Khan stops short in his tracks when he hears someone calling out to him by his pet name, “Dullu”. Nobody in Bombay knew or called Salim Khan by his pet name except the Amarnath family. He recognizes my brother approaching him, gives him a big smile, and puts his arms around his shoulders. Emotional & nostalgic memories of the past flash before their eyes. 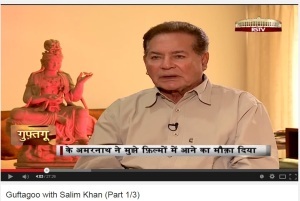 Salim Khan very graciously agrees to make some time to do the interview for an upcoming book on my dad, “K. Amarnath – Remembering a Stalwart of the Golden Era of Indian Films”. Thank you, Dullu-Salim Khan. Thank you for all the candid and personal recollections that you shared with us while reminiscing about my dad with my brother, Mohan Amarnath, and cousin, Ranjan Sain. So, Ajit called me over and Amarnathji asked me if I would like to act in movies. Many people had told me that I should be in the movies, but my main interest at that time was to play cricket and I had joined college just for that reason. I told Amarnathji that I was fond of watching movies – but didn’t have any acting experience. Amarnathji replied that many of the top stars too didn’t have any acting experience when they started – they just improved and excelled as they went along. 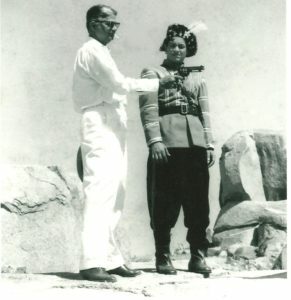 Look at Amarnathji’s confidence – he had made up his mind and went ahead with his decision – he gave me an advance, sort of a signing agreement and invited me to come to Bombay. He said he would take a screen test and give me a break in the movies. When I arrived in Bombay, he made arrangements for my stay and paid for my monthly expenses during the time a story was being developed for me. Amarnathji was working on a subject and had plans to launch me in a big way in his next movie. But unfortunately, he incurred an unexpected heavy loss in the movie “Kal Hamara Hai” (1959) and was not in a position to launch a newcomer in his next movie. 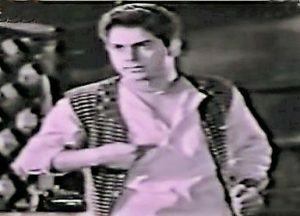 So, I was given a small role, that of the younger brother of the hero, Ajit, in the movie, “Baraat” (1960). 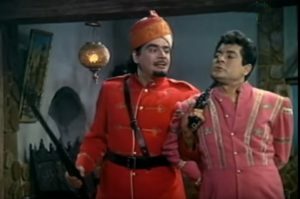 Then again in 1962, I was given a small role playing the villain’s son in “Kabli Khan” (1963). I could not refuse Amarnathji since I wanted to stay in contact with him. The next few years I struggled and whenever I would by chance see him at Ranjit Studios where he had his office, he would ask me “Is everything all right?” and I would say “Nahi (No) – everything is not all right.” Then Amarnathji would immediately take some money out of his pocket and give it to me. That would help me pay some minor bills – for chai (tea) and laundry !! He continued helping me and would be happy for me whenever I would get a few roles on and off in movies produced under other studio banners. Amarnathji was always concerned about my welfare and he generously supported me even when I was not working for him. I used to go to their place by the seashore quite often. I felt like a member of their family. His children were small at that time. I remember playing cricket with them on the beach. I became so close to Amarnathji and his family that even now, after more than 50 years, I still remember their car license plate number – “2018” and coincidently this is the year “2018” too !! I respected him a lot – would never even smoke a cigarette in front of him. Amarnathji was a very smart & stylish man. He lived a very high lifestyle – going to the races, going to clubs, playing cards. He used to watch a lot of old English movies. A big-hearted and generous man – gave a break to many newcomers like me. Many people are not aware of the fact that he made so many movies. The body of his work is absolutely amazing. He was very active for his age. He is one of the people in my life to whom I shall always be grateful. The entire conversation was very casual and lighthearted, but with a tinge of sadness that whoever was being remembered that afternoon was no more – my mom, my dad, actor Ajit, my uncle Kaushal and my brother Satish. As we all know that after struggling for a few years as an actor, Salim Khan realized that writing was his forte and his interest switched from acting to script-writing. With his powerful movie screenplays, Salim Khan became the greatest and highest paid scriptwriter in Bollywood. in catapulting mere Stars into Super Stars !! I suppose my father had played an important role in Salim Khan’s life, especially at a time when he was just 23 years old, a typical youth – at the crossroads of his life, indecisive about which path to follow – play cricket, become a pilot, join the police force or act in movies. K.Amarnath showed him the direction he should take !! Come to Bombay, I will launch you in my next movie. helped shape Salim Khan’s destiny !! Whether it is for an article in a newspaper, an interview for a tv show or even an award function, Salim Khan always remembers my dad, K.Amarnath for having introduced him to the Indian Film Industry – Bollywood. and for acknowledging the contribution he made in your life. In 2013, during one of my long-distance conversations with my eldest brother, Satish, while discussing about my webpage “Tributes and Comments from Family & Friends”, my brother asked me if he should try and get a tribute from Salim Khan and I said, “I would love that”. I replied, “Of course, right after my Main Page”. Today, on Dec 1st, 2018, I will be fulfilling my promise to my dear late brother, Satish, by posting Salim Khan’s tribute to my dad on my website right next to my Main Page.